You’ve found kOZMIC Press, the home of publishing for fans by fans! Our three titles so far all focus on Doctor Who, but more worlds will be explored as we grow! We appreciate you checking out our titles and hope you find something here that you’ll enjoy. Visit our Titles page to order! Children of Time: Available Now! After a very successful launch at the WHOlanta Convention (May 4-6, 2018), Children of Time: The Companions of Doctor Who is now available for wide release. Children of Time covers 88 of the Doctor’s Companions, Friends and Associates from the television show, comics, novels and audio adventures. The Doctor’s Companions: The school teachers, the kiss-o-gram, the journalist, the savage huntress, the shop girl, the stewardess, the doctor in training, the alien mathematics wizard, the Best Temp in Chiswick (100 words per minute! ), the Scottish Highlander, the form-altering android and even the robot dog! Such a wonderfully varied collection of characters from all times and places. And that’s just from the television series! It gets even weirder when you start to consider the companions from the comic books, the novels and the audio adventures. There, you encounter a murder lizard from a world with no time, an amphibian warrior-queen who quotes Star Trek, a shapeshifting private detective who usually assumes the appearance of a penguin, a Cyberman with a soul, a Dalek-hunting mercenary, and even a talking horse. The companions are an incredibly diverse lot. No wonder audiences have been so drawn to them since the show’s origin in 1963. They’re us. Yes, even the talking horse is us. They’re the ones who get to travel with the Doctor, share in his adventures, and see the wonders of the universe. All the things we wish we could do. Proceeds from sales of Children of Time: The Companions of Doctor Who are donated to Furkids, Georgia’s Largest Animal Rescue and No-Kill Shelter. 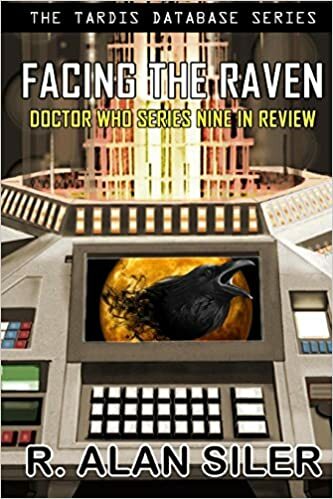 Now available for order: Facing the Raven: Doctor Who Series Nine in Review. By taking the best of modern Doctor Who (like character drama and series-long story arcs) and the best of classic Doctor Who (multi-episode stories, cliffhangers, fewer modern-Earth settings, etc) 2015 gave us one of the greatest seasons the venerable show has ever produced. Facing the Raven: Doctor Who Series Nine In Review includes an overview of the series’ themes, in-depth analyses of each episode, exhaustive background details, a timeline of events leading up to the broadcast of the season, and exclusive interviews with director Rachel Talalay, scriptwriter Jamie Mathieson, prosthetic effects producer Kate Walshe, and creature performer Jon Davey. Facing the Raven is 178 pages and is $10.00. You can order a copy here. Children of Time: The Companions of Doctor Who is a new non-fiction anthology that focuses on the Doctor’s companions: the teachers, the journalist, the Highlander, the temp, the stewardess, the medical student, the archaeologist (both of them! ), the kiss-o-gram, a mother, a grandfather, and even the tin dog! All the Doctor’s traveling companions and faithful friends get featured in this volume. Earth’s past, sometimes into the future, and other times to distant and exotic planets — and they take us along with them. We sit in the comfort of our living room while they encounter all the danger! They’ve survived Dalek invasions, Android invasions, and Christmas invasions. The companions ask questions, get in trouble, get out of trouble, and challenge the Doctor to think and act in new (and usually better) ways. Children of Time: The Companions of Doctor Who will feature profiles of Companions from all forms of Doctor Who: television, audio, comics and novels. mes, how Turlough is the first companion to get a true character arc, the ultimate love letter to Melanie Bush, and a transcript of Jackie Tyler’s speech to a support group for mothers of kids who’ve gone off traveling with the Doctor (attendees of the group include Sylvia Noble and Francine Jones), plus many other surprises. We also have involvement from three of the Doctor’s companions: Katy Manning and Daphne Ashbrook, along with Mark Strickson, who has written the book’s introduction! Projected release date is May, 2018. More details on that forthcoming. Very pleased to announce that the introduction for Children of Time: The Companions of Doctor Who has been written by none other than MARK STRICKSON, who played Turlough in the 80s! As you probably know, Mark took a break from acting to become a zoologist and then moved into a hugely successful career as a nature filmmaker. He helped launch the career of Steve Irwan – Crocodile Hunter! Mark has a passion for animals, and I’m thrilled to have him involved in this book supporting Furkids, Inc! This news is announced today on the Discussing Who Podcast — take a listen to get a preview of this year’s WHOlanta Convention and of Children of Time! CoT Cover Reveal … Almost! It’s nearly time! The book goes to the printer in SEVEN DAYS! All the essays are in place, all the artwork has been submitted, and the final pieces are coming together! We’re on track for our May 4 release date! If you’re going to be at the WHOlanta 2018 convention (May 4 – 6 in Atlanta, GA) you’ll be among the very first people to see it! I hope you’ll be there! Children of Time: The Companions of Doctor Who: This anthology covers nearly 80 of the Doctor’s assistants, associates and friends, covering characters from television, comics, novels and audio. Contributors include actors from the show (Katy Manning, Daphne Ashbrook and a third TBA who has written the book’s introduction), character creators from Big Finish (Iain McLaughlin, who created Princess Erimem, and Matthew J. Elliot, creator of the Sixth Doctor’s newest companion, Mathew Sharpe), plus well known artists, authors, and fans of all stripes. Sales of the book go to support Furkids, Inc. Learn more by visiting the book’s page. Releasing first weekend of May at the WHOlanta Convention.